Only A Christian Consular Did Help Me, Pat. Looking at my social media profile during that time, you wouldn’t have had a clue. To the rest of the world, my life looked great. But inside, I was crumbling. I faced a secret battle. I was in the thick of postpartum depression, and my days were filled with tears, anxiety and feelings of being overwhelmed with life and all that it entailed. Life felt so dark, and I felt so alone. Scrolling through other people’s social media pages furthered my depression as I wondered: Why is everyone happy but me? What is wrong with me? Why can’t I get it together? We live in a world where everyone presents their “picture-perfect” self on social media. As you scroll through, you’ll find what appear to be flawless families in our happiest moments. We are out to show the world the best in us, even when it’s not always reality. I’m afraid we’ve become so accustomed to showing our “best” that we’ve lost the ability to open up, even with the people we trust, about what’s going on behind the scenes. Marriage is an invitation to share our brokenness. It’s an opportunity to shed our facade and get real with who we are and with our struggles. It’s a chance to share our burden with the built-in helper God has given us. God knew we needed this when He proclaimed it is not good for man to be alone. (Genesis 2:18) Marriage is our time to declare that although we will struggle, we will no longer struggle alone. We don’t often talk about the importance of confession within marriage. In a survey I did of over 1,000 married people, nearly 50 percent of them reported that confessing their sins and struggles is what they discuss least in their marriage. It’s an important discipline that seems to have been lost in our world. But more concerning to me is that it’s been lost in our marriages. As a professional counselor, I believe confession is an important part of building trust and achieving authenticity and freedom in a marriage relationship. To be known — fully and completely — is one of the greatest feelings two people can experience within the context of a marriage. It’s not a love based on who someone thinks you are; it’s a love based on who you really are when the facade’s been dropped. Scripture repeatedly teaches us that confession plays a significant part in the life of believers because it’s when we acknowledge our great need for a Savior. Confessing our sins to our Lord is the only thing that can move us from darkness into light (1 John 1:9), but confessing our sins to others is what keeps us there. According to Scripture, confessing our sins to one another and praying for one another is how the process of healing takes place: “Confess your sins to one another and pray for one another, that you may be healed” (James 5:16a, ESV). There is power in prayer and confession. 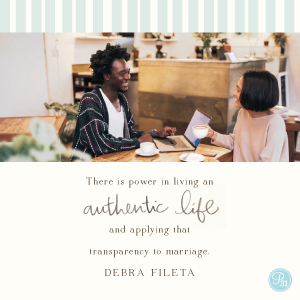 There is power in living an authentic life and applying that transparency to marriage. Even when it’s hard. Even when it’s messy. Even when it hurts. It is only in the light that sins and struggles begin to lose their stronghold. Only in the light can we really be set free. Dear Jesus, give me the strength to live an authentic life. Give me the courage to come to terms with my struggles and secrets and be healed by the power of Your Light. In Jesus’ Name, Amen. There’s a huge difference between the expectations of marriage and the reality of married life. Whether single, married or engaged, Debra Fileta’s book, Choosing Marriage: Why It Has to Start With We>Me, will help you learn about eight choices you can make today, in order to build a better marriage tomorrow. To connect with Debra, stop by her website at www.TrueLoveDates.com or visit her on Facebook www.facebook.com/truelovedates/. Are there any secret struggles or sins from your past or present that you are deliberately keeping from your spouse? How can you begin applying the healing power of confession to your marriage? To your closest relationships? To your friendships?